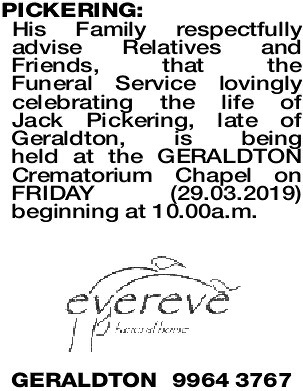 His Family respectfully advise Relatives and Friends, that the Funeral Service lovingly celebrating the life of Jack Pickering, late of Geraldton, is being held at the GERALDTON Crematorium Chapel on FRIDAY (29.03.2019) beginning at 10.00a.m. Passed away peacefully on 20.03.2019. Husband of 60 years to Pat. Loving Father and Father-in-law of Greg, Michael, Marcus (dec), Amanda, Louise and Grandfather of Jarrod. You will be forever in our hearts and we will cherish many happy memories. 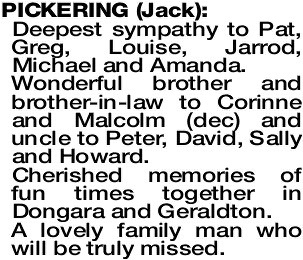 Deepest sympathy to Pat, Greg, Louise, Jarrod, Michael and Amanda. Wonderful brother and brother-in-law to Corinne and Malcolm (dec) and uncle to Peter, David, Sally and Howard. Cherished memories of fun times together in Dongara and Geraldton. 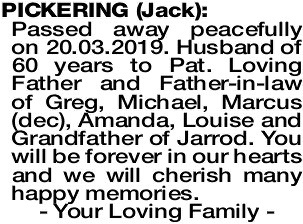 A lovely family man who will be truly missed. Loving memories of my brother Jack. Always sincere. Beryl and family. 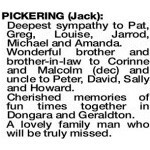 PICKERING JACK Fond memories of all the fun times together. 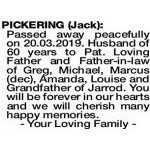 PICKERING JACK Our condolences to Pat, Greg, Michael and families. We will always remember the great contribution Jack made to the development of our District. Jack spent his working life administering our Shire and was a great contributor in many aspects of our district.